After what has felt like an eternity, “The Flash” is back for season three! 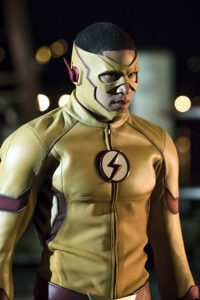 After The Flash and co. defeated Zoom in the season two finale, Barry, suffering from grief over the loss of his father so soon after reappearing in his life, decided (rashly and selfishly) to go back in time to the night Reverse-Flash killed his mom to save her. Thus, an alternate reality was created, aptly called “Flashpoint,” based on the comics story line of the same name. 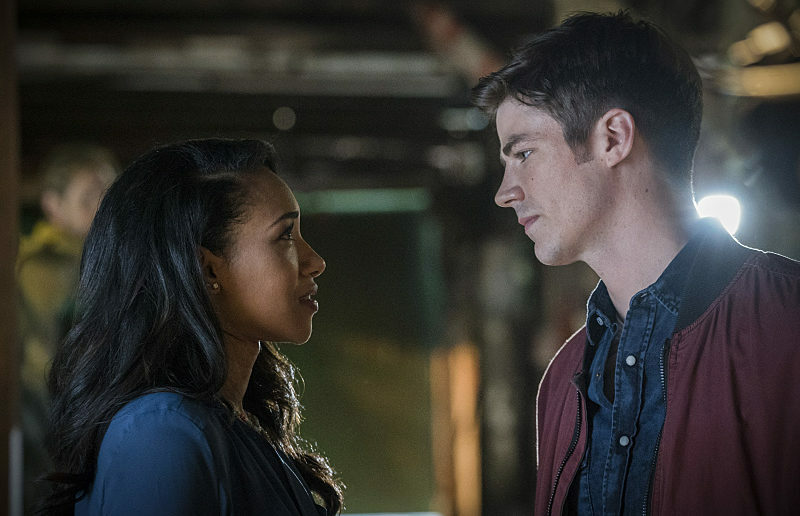 The episode kicks off with Barry nervously getting up the nerve to ask Iris West out on a date. He’s been living in this new time line for three months, his parents are alive, well, and still in love. But what about everyone else? For one thing, Barry no longer has a close relationship with Iris and she only vaguely remembers him from school. But that’s cool because Barry can start over and woo her, time line be damned. But of course, nothing is as simple as that. So while Barry has his parents back and he’s asked Iris out, there’s a new speedster terrorizing Central City who goes by the name of The Rival, his close relationship with Joe is non-existent. The two only have a professional relationship. Joe is borderline depressed, absent from work, and a drunk (all the things Joe West should not be). This makes me very unhappy. Cisco Ramon is the richest man in America and Caitlin Snow is a pediatric eye doctor, of all things. Going into the episode knowing that Flashpoint was only going to be one episode lowered certain expectations. Although I believe the story line itself may have fared better if it had instead been a two-parter. Then perhaps the emotional impact may have been more heavily felt. We were just getting to know these new versions of all of the characters and, too quickly, everything was undone. From a logistical perspective, it’s easy to understand why. We’ve spent two seasons with these characters already. To remain in an alternate timeline where any developments made would have been erased when Barry goes back to the night his mom died (again) wouldn’t have done much for any of the characters. However, the episode is the best premiere since the pilot and had a lot of parallels to it as well. The episode’s villain, The Rival, is unimpressive and kind of forgettable. This is where the episode struggled with the overall repercussions of Flashpoint in its attempts to shoehorn in a villain. But what it did do was allow Wally, as The Flash (or Kid Flash, as an in-joke throughout the episode), to show off his skills and get in on the action. 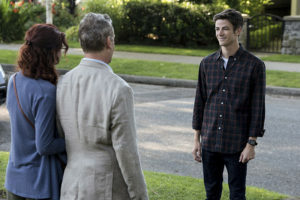 Barry quickly gathers the now fractured team, which includes a very reluctant and very rich Cisco, but the core of the episode is the relationship between Barry and Iris. It’s been made clear on the show that no matter where we find Barry and no matter what changes, Iris is a constant. The best episodes of “The Flash” are those that implement a lot of Iris and this is definitely the case here. 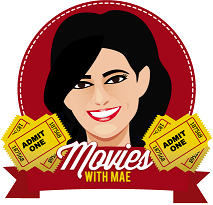 She’s in on the action and she has agency, acting of her own volition even when she finds out that her life is going to be changed. And seeing her and Barry together, flirting and bonding, brings me great joy. Their chemistry is palpable and they nail everything from their meet-cute at Jitters to the more emotional scenes near the end of the episode. 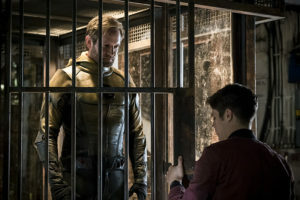 Reverse-Flash is also back and his conversations with Barry are insightful. He questions Barry’s actions. And, although the titular hero thinks he has it all, does his decision make him the villain of this story? Contained as it was, doing “Flashpoint” was a bold move, but one that ultimately doesn’t carry as much weight as it would have given the fact that we’ve seen Nora Allen die a few times now. And also because it seemed like Barry had learned his lesson at the end of “The Runaway Dinosaur” last season. What’s far more interesting is what the ramifications will be after the fact. Because, if this gets Barry to once and for all learn that messing with time doesn’t only affect his life, but also the lives of those he loves and cares about, then it has served its purpose. As an episode, “Flashpoint” does a good job of setting up the remainder of the season and I’m glad that the show looks like it’ll actually deal with the ramifications of time travel instead of just sweeping it under the rug like they’ve done in the past. Yeah, who is this dashing young speedster, huh? Do you know? You even care? While you sit around and hide like a lost, lonely little boy, letting someone else risk their life to protect the city, our common enemy is coming for us both. Barry and Iris’ meet-cute in Jitters is the most adorably sweet exchange this side of any romantic comedy/romance movie from the last couple of years. Really, that entire scene was gold. Barry drawing lines on the board to explain the timeline changes legit reminded me of “Back to the Future II.” And also, why are there always lines and circles when something is being explained on this show? When did Eobard have time to shave between killing Barry’s mom again and leaving him on the porch? Barry can be adorably awkward sometimes, but then he says lines like “It escapes definition” when describing his and Iris’ relationship Smooth, Allen. I love Matt Letscher as Eobard Thawne. So glad he’s back! It hurts my heart that Joe is estranged from Iris and Wally. It hurts my heart even more to find out that after “fixing” the timeline, Iris and Joe are still not talking. Let the Wests live. It took Barry years to finally tell Iris about his feelings. In Flashpoint, it took him 3 months. Progress. Loved all the callbacks to the pilot episode. Wally rolling his eyes after Barry says he’s The Flash. A great moment. Barry advising Wally about upping security because anyone could walk into his Flash headquarters is ironic given the terrible security at STAR Labs. Cisco rocks a mean ponytail. Where are those damn time wraiths when you need them? Time travel rules on “The Flash”: Rules? What rules? "Flashpoint" does a good job of setting up the remainder of the season even though it could have fleshed out certain points and the emotional impact by making it a two-parter.